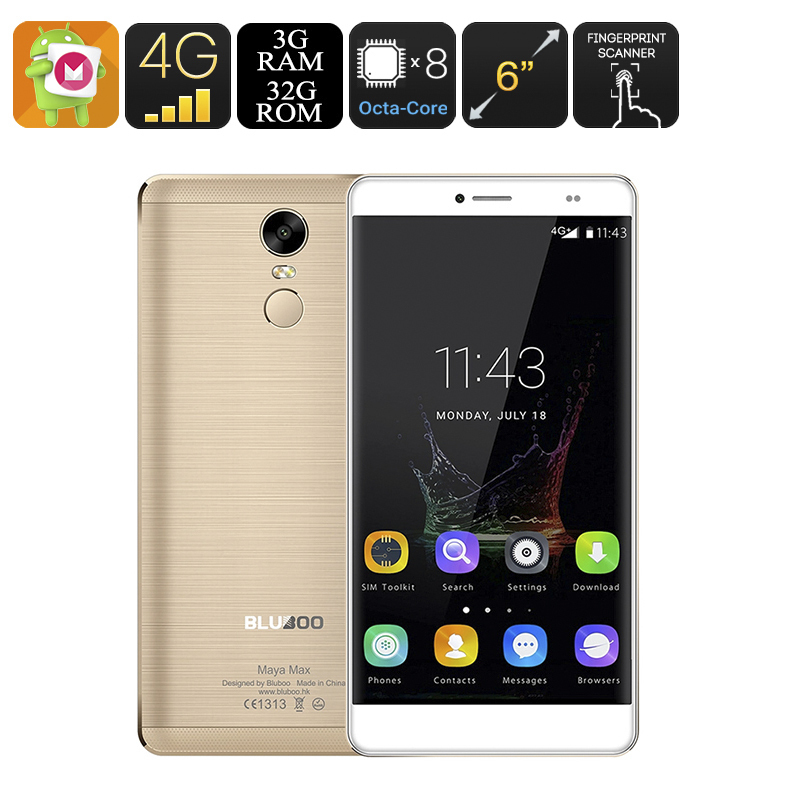 Successfully Added Bluboo Maya Max Smartphone - 6 Inch Screen, Android 6.0, Octa Core CPU, 3GB RAM, HotKnot, 13MP Camera, Fingerprint Sensor (Gold) to your Shopping Cart. The Bluboo Maya Max is a beast of a phone with its large 6 inch screen its taking the phablet market by storm with its HD resolutions and great specs. Despite only costing a fraction of the price of leading flagships the Bluboo Maya Max packs a punch in performance with its Oct Core MTK chipset clocked at 1.5GHz, add to that the 3GB of RAM and a snappy Mali T860MP GPU and you have an awesome package that is quite rightly rewriting the phablet market. An Android 6.0 OS is complimented by a trio of advanced features, such as the fingerprint sensor that lets you unlock the phone, authorize purchases or even sign into apps. With Smart Wake available you can easily access apps by simple tracing a letter onto the screen making for fast navigation so not more scrolling to find that app icon again. The May Max even boast HotKnot - the quick contactless way to transfer data and contacts. The Dual SIM smarphone brings access to 4G connections so you can enjoy the fasted cellular data speeds - ideal for streaming movies when on the go. As there are two IMEI numbers each SIM card can be acitive at the same time letting you organize both business and personal contacts on the one device. The smartphones large IPS screen offers up HD resolutions so you can play games and watch movies in great detail. with a built in 4100mAh battery owners of the Maya Max can enjoy some incredible usage times for such a large screen devices making it an attractive option for those not wanting to recharge throughout the day. When it comes to optics a rear 13MP Sony sensor snaps great shots and can shoot in 1080P so your guaranteed some awesome video footage. With this spectacular line up of features and hardware the Maya Max Smartphone is great value for money and comes with a 12 months warranty, brought to you by the leader in electronic devices as well as wholesale Android smartphones..
Arabic: - الهاتف الذكي 6 بوصة - Chinese Simplified: - 6 英寸智能手机 - Czech: - 6 palců smartphone - Dutch: - 6 inch smartphone - French: - smartphone de 6 pouces - German: - 6-Zoll-smartphone - Hebrew: - 6 סנטימטר החכם - Hindi: - 6 इंच स्मार्टफोन - Hungarian: - 6-os okostelefon - Italian: - 6 pollici smartphone - Japanese: - 6 インチ スマート フォン - Korean: - 6 인치 스마트폰 - Malay: - telefon pintar 6 inci - Norwegian Bokmål: - 6 tommers smartphone - Romanian: - 6 inch smartphone - Russian: - 6-дюймовый смартфон - Spanish: - 6 pulgadas smartphone - Thai: - สมาร์ทโฟน 6 นิ้ว - Turkish: - 6 inç smartphone - Vietnamese: - 6 inch smartphone.